–Brian Buffini, President and Founder, Providence Systems, Inc. Anyone who wants to turn their real estate practice into a highly successful business must understand the fundamental models that drive the best real estate agents in the industry. In The Millionaire Real Estate Agent these models are revealed and explained. This book represents the culmination of decades of real estate experience, research, and consulting, with case studies from some of the top millionaire agents in the U.S.
Three key concepts that drive mega-agent production. Essential economic, budgetary, organizational, and lead generation models that are the foundations of any high-achiever’s business. 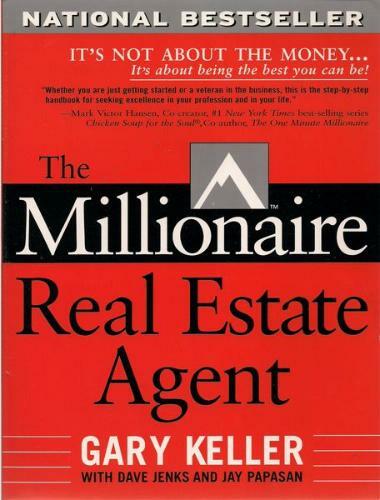 The distinguishing characteristic of Millionaire Real Estate Agents–the way they think! How you can get on the real estate career path to “Earn a Million,” “Net a Million,” and then “Receive a Million” dollars in annual income. The Millionaire Real Estate Agent is not about quick fixes. It is about the innovative application of proven business techniques to the real estate industry. Isn’t it about time you put your career on the path to becoming a Millionaire Real Estate Agent?